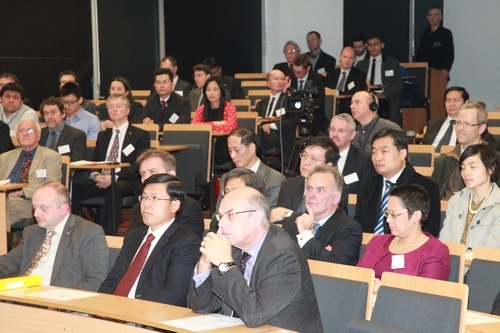 The opening of the China Institute of Birmingham University makes this a memorable day. This is an important milestone in the long history of relations between Birmingham University and China. I wish to offer my warmest congratulations for opening your new China Institute. The first Chinese students arrived at Birmingham University in 1907. 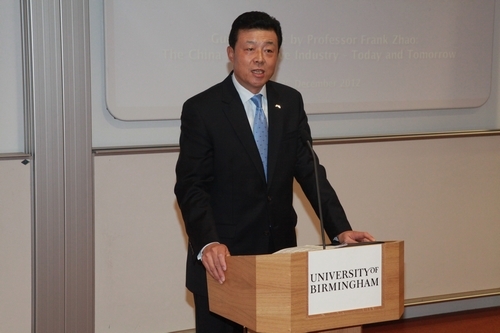 Since then strong ties between Birmingham University and China have continued for more than 100 years. In these years, a total of more than 7,000 Chinese students and scholars were inspired by the wealth of knowledge and academic excellence of this university. One of them was Professor LI Siguang, the founder of China’s geomechanics. This influence and long friendship spans many generations between China and Birmingham University. The result is that Birmingham University is one of the most popular British institutions of higher education among Chinese students. This deep connection also makes Birmingham University one of the British universities with the most successful educational exchange and cooperation with China. I understand the European Research Institute of Birmingham University is the best in UK. I naturally hope that its China Institute opened today will become Britain’s first class institute of China studies. So, how can you beat other institutes and become a leader in the field of the study of China? I believe the key lies in how you study and what you study. My consistent suggestion has been to prioritise modern China over ancient China. Of course, China takes great pride in the richness of its five thousand years of ancient civilisation. There are many British institutions and scholars devoted to the study of ancient China, and deservedly so. But the fast changing China of today merits much greater study, analysis and attention. Institutions and scholars specialized in this field are not too many, but too few. Accomplished ones are even less. So I hope your China Institute will raise its vision to rise way beyond a conventional Sinology Academy. I believe your China Institute should have the ambition to break new ground and become a global leading neo-Sinology Academy with a focus on contemporary China. If you aspire to that vision then what do you need to study about contemporary China? I suggest you focus on the following three areas. China’s development path concerns the future of the country. It bears on the fate of the nation and the happiness of the people. China is the world’s largest developing country and the biggest emerging economy. China’s national conditions determine that China must follow its own path. Chinese people believe profoundly that we have found the right path. It is a path that has proved successful. This is the socialist path with Chinese characteristics. In reading British media, I have found there is much confusion and misunderstanding about the meaning of the socialist path with Chinese characteristics. What is needed to understand the meaning is an open mind and careful study. That is where your new China Institute has a vital role to play. The second area I encourage your China Institute to study is China’s theory. Since the launch of reform and opening up 30 years ago, China has kept an open mind and moved to keep abreast with rapid global changes. At the same time China has successively adopted Deng Xiaoping theory, the important thought of ‘Three Represents’ and the ‘Scientific Outlook on Development’ as integral parts of our theory system. All these are crucial guidelines for China’s development. I find it astonishing how few western analysts of China focus on the theory that China has applied. There seems to be very little intellectual curiosity and hence lack of analysis of how China has secured over three decades of fast growth by applying the right theory. Let me turn to the third area I suggest you study. This is an analysis of contemporary China’s institutional development. China’s development would be impossible without institutional guarantee. China did not copy any other country’s system and institutions. · Why does China insist on the system of People’s Congress? · Why does China not go for multi-party politics but embrace a system of multi-party cooperation and political consultation under the leadership of the CPC? · Why does China carry out the system of regional ethnic autonomy? · Why does China need to enforce a basic economic system where the public ownership is the mainstay and multiple ownerships grow side by side? I am sure you will be fascinated by studying the answers to these questions. This will especially be the case if you compare China today with China in different historical stages or with other countries in the same period of time. I am afraid you will not see a true and full picture of China through a telescope, nor with a microscope, nor by colored spectacles. To view China in perspective, there needs to be an independent and open mind free from prejudices and cold-war mentality. I hope you will research deeply what is behind China’s progress in recent decades. I encourage you to develop an intimate knowledge of what is going on in today’s China. In so doing you will become a bridge for communication and understanding between China and the world. Indeed, I urge you to take on this as your mission and responsibility. 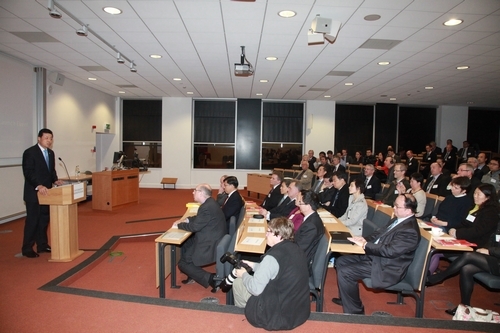 In conclusion, I wish the China Institute of Birmingham University a great future and success!